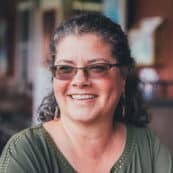 A friend of mine contacted me months ago, looking for advice on hosting more eco-friendly dinner parties at her home. Like many of us, she’s noticing the waste that occurs when she hosts a group of people and has become concerned about it. We entertain pretty regularly. We have parties, and I host book salons at our home 2-3x per year. So, about once every other month, we have between 20 and 45+ people here. That usually involves a couple of cases of bottled water as well as disposable utensils, paper plates, etc. The plastic just kills me and I’ve decided it has to stop. Do you have ideas for sustainable entertaining for large groups? I tend to wash the plastic utensils, but they’re really only good for 2-3 uses before they start looking gross. Plus, they break and some get disposed of before I can grab them. One thought is to buy reusable plastic cups, but then it’s hard to keep track of which is whose. With disposables you can simply put initials on them with a marker. I’m going 1,000 mph [getting ready] and often setting up even after people arrive. It’s easy to buy packages of plates, napkins, flatware, etc. and call it done. Storage space is also an issue. And also durability. We have indoor/outdoor parties. If someone drops something on the cement patio, it’s not a huge issue now. If it shatters into a million pieces, then we have a problem. 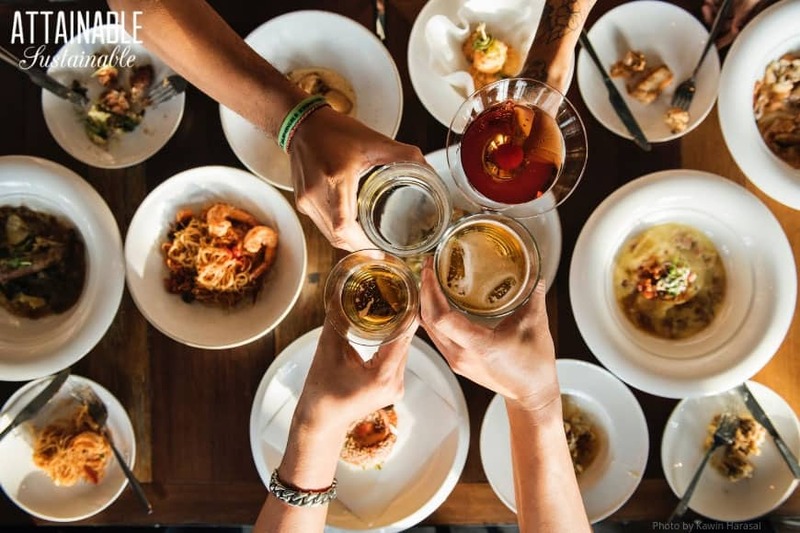 Planning green events and environmentally friendly dinner parties means striving to cut down on waste. It’s a worthwhile effort. The biggest hurdle to hosting a no-waste party? Disposables. Whether we’re talking about paper plates, plastic cups, bottled water, plastic tablecloths, or decorations, our goal here is to figure out how to replace those easy disposables (because let’s be honest, they are easy) with reusable options. 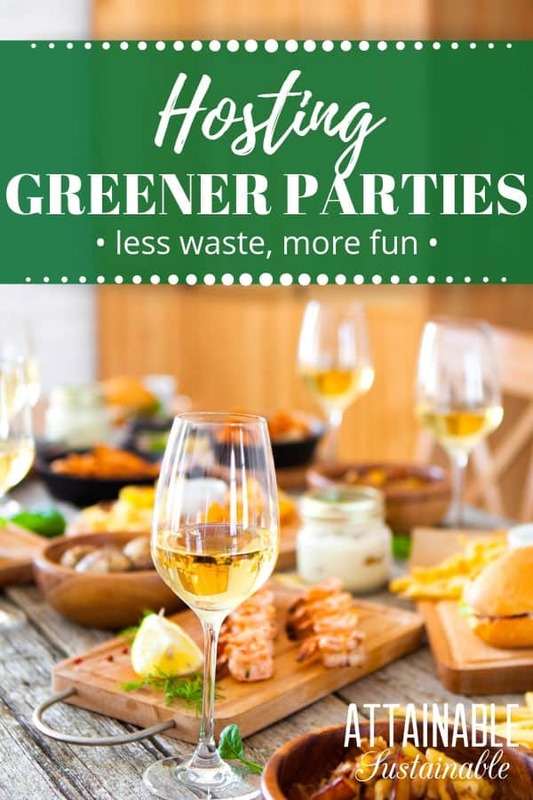 Instead of buying paper plates and cups every time you have an event or host a dinner party (talk about buying something with the express intention of throwing it away! ), decide upon a plan that will work for the long term. One friend of mine collected a mish-mash of ceramic plates and cups from garage sales and thrift shops for hosting events or a dinner party at her home. At a quarter a pop, she’s not concerned about these items getting damaged, and they come out again and again. She’s graciously shared this collection with friends for hosting events, too. If you’ve got a place to tuck a stack of plates away on a shelf, this is quite possibly the best solution. They are breakable, but ceramic is less dangerous than glass if one does accidentally end up hitting the ground. If you’re concerned about having unmatched dinnerware, aim for a collection of all-white. 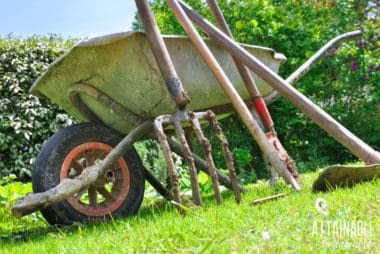 They’ll look good together and work in any season. Add red accessories for Christmas or Valentine’s Day, orange for Halloween and Thanksgiving. If you’ve ever grown bamboo, you know how fast it grows. 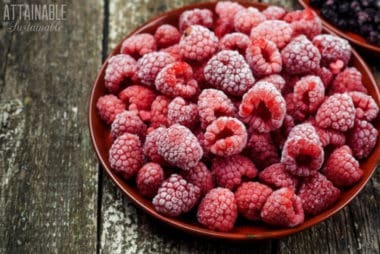 It’s a renewable crop that can be turned into a multitude of products. 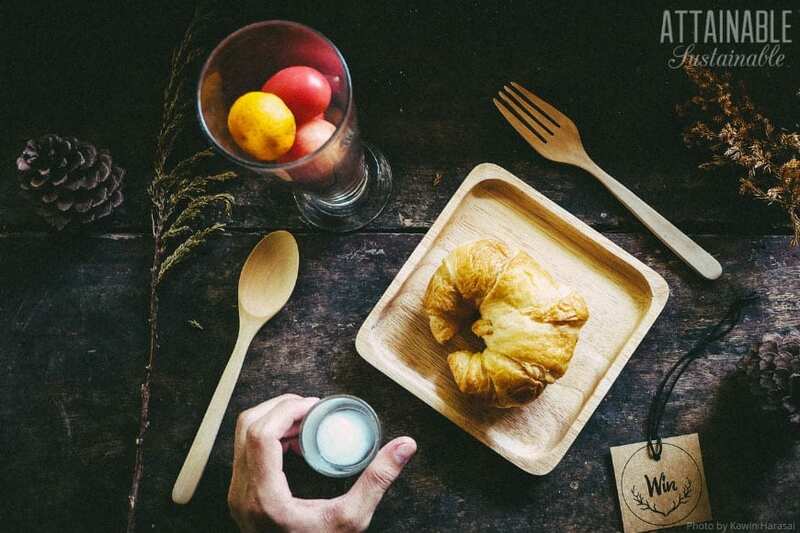 These plates and cups made from bamboo are the best of both worlds. They’re sturdy enough to last for five years or so. After that, they’re completely biodegradable. If you’ll be hosting a party for kids, these are a great non-breakable option and they can do double duty as party favors. Storage for “extra” dinnerware is a problem for a lot of us who strive for green events. One way to handle this is to switch your every day dinnerware over to something that can double for entertaining, and keep more than you need for daily use on hand. 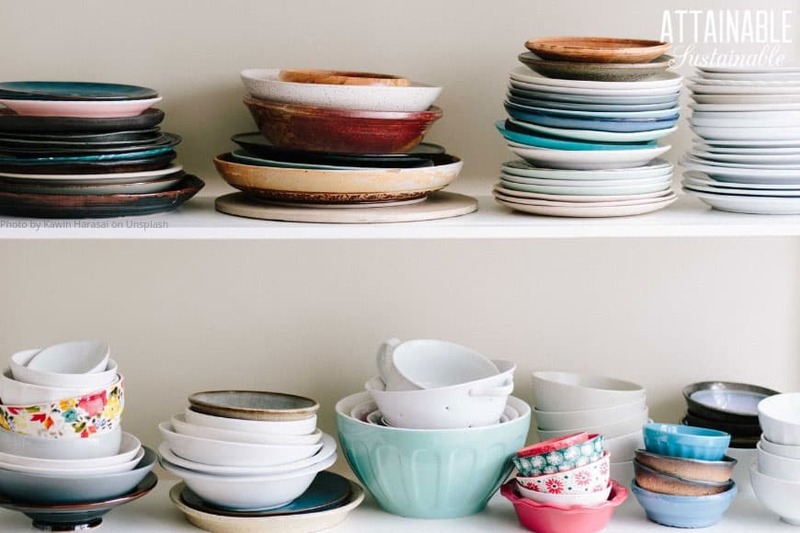 A taller stack of dinner plates is easier to accommodate on a shelf than creating a completely separate storage area. 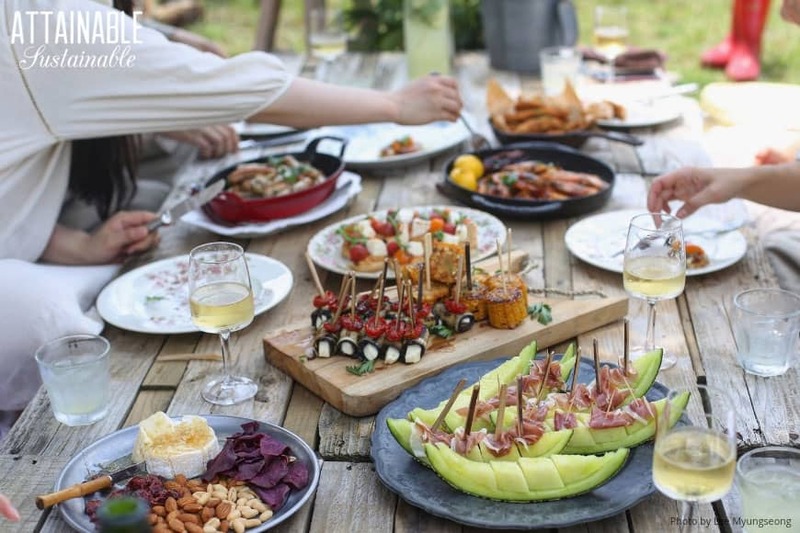 If you must use disposables at your dinner party, choose a product that is decomposable and be sure to provide a separate receptacle in which to gather dirty plates for the compost pile. And read this to make sure the plates you choose aren’t full of toxins. These square plates are made of bagasse, a rapidly renewable sugar cane stalk. Made of wheat straw fiber, these paper plates are unbleached. These palm leaf plates are prettier than the standard paperboard plates. We’ve all been to the party with red plastic cups and a Sharpie marker. It works for helping people keep track of their drink, but the trash that can generate is cringe-worthy. As my friend said, though, people often have a hard time keeping track of their drink. A collection of suitable cups paired with a beverage dispenser (or two) will go a long way toward eliminating plastic waste. Plastic cups are nice for patio parties because they won’t shatter like glass. But there are other safe alternatives that are not plastic. Try these stainless steel tumblers or — of course — bamboo is an option here, too. Signing your name in Sharpie directly on a cup is easy, sure. But it renders that cup a single-use disposable. (Here’s why recycling isn’t the solution.) Instead, use an alternative marking method so people can find their drink easily. Reusable vinyl labels will stick to smooth surfaces for labeling. If wine glasses are part of the plan, wine charms are the solution. Again, if you must use disposables when you host a party, opt for biodegradable paper cups rather than plastic. Let’s be honest. NOBODY likes using plastic utensils. A large collection of utensils will not take up much space in a cupboard or pantry. Gather knives, forks, and spoons in pretty containers like this and they can even be stored in full sight. 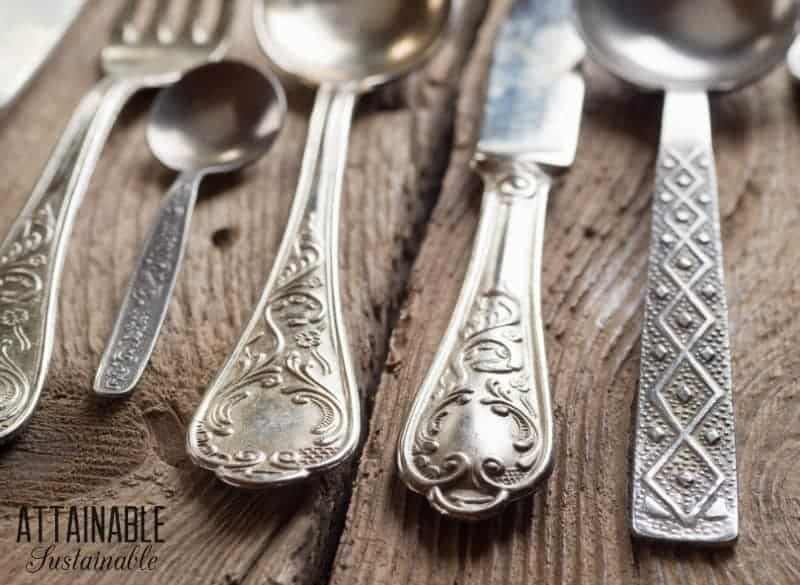 If you’re a thrifter or stop at garage sales regularly, start collecting utensils for hosting green events and dinner parties. You don’t need a matched set or extras like dessert forks unless you’re really fancy. Some people don’t like the idea of used or mismatched utensils. For about $50, you can get a dozen forks, spoons, and knives and you’ll never have to buy plastic utensils again. I’m a big fan of cloth napkins for home use. They’re cheap, easy to make, and last for years and years. A determined person could certainly use cloth napkins for small gatherings. That said, napkins are one disposable element of occasional entertaining that I can let go pretty easily. If you opt to go the disposable route when hosting a party, choose napkins made from recycled content like these, and then toss them into your compost bin when the party’s over. When we’re hosting a party, it’s fun to make the space look festive! But party decor doesn’t need to go straight to the trash. Skip the plastic table coverings. Even paper table coverings are lined with plastic, and it’s all going to end up in the trash. Cotton or linen tablecloths are easy to wash and store, and readily available at secondhand shops. They’re festive, yes, but who needs that waste when you can hang these reusable options instead? 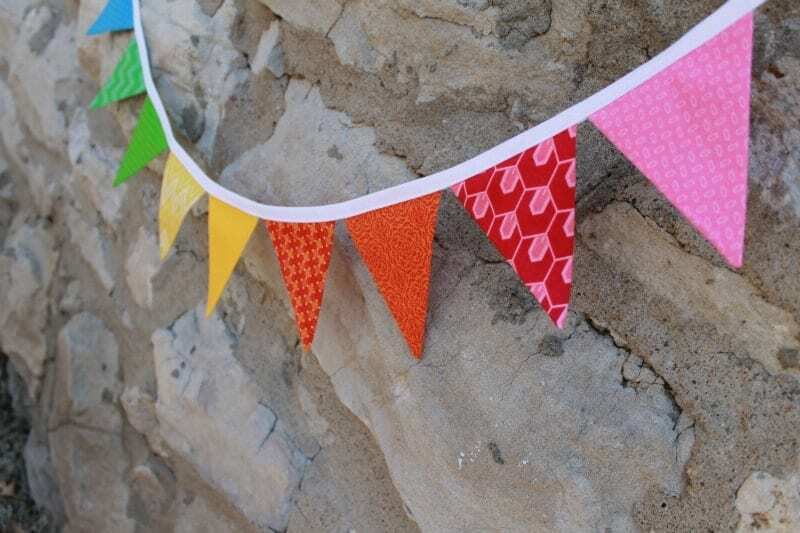 Instead of crepe paper or other disposable garlands, choose a couple of these sweet reusable banners to decorate. Greenery and flowers are nature’s decorations. Take a hint and use them to dress up your party, then toss them into the compost when you’re done. If I was the queen, I’d eliminate the idea of party favors. (Does that make me sound grumpy?) These are most popular, of course, at kids’ parties, and often come filled with cheap plastic crap bought solely for the purpose of fulfilling some weird social obligation. If you must give party attendees something, wrap up a book, a small puzzle, or a cool set of pencils. At least those things will be used and they’re not made of plastic. You can rent just about anything you’d need to host a party. Chairs, tables, table linens, utensils, china, and beverage dispensers are just some of the things you can borrow. For large, occasional events renting might be the perfect solution. Instead of party “goody” bags I have passed out containers of sidewalk chalk, or bottles of bubbles, or one time we did an arts and crafts project at a birthday party using rubber stamps to decorate notebooks. Party activity and a take home item, all in one. These are such great ideas! 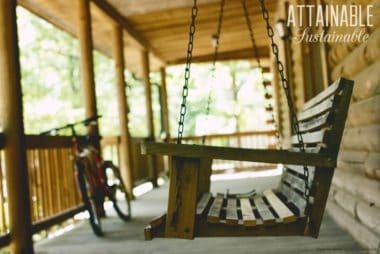 We’re hosting our own rehearsal dinner for our wedding in a few months, and we’ll definitely be using some of these tips. I love the idea of thrifted plates and utensils–something about the eclectic, mismatched look is really appealing to me! I have a “set” of totally mismatched plates, dinner, salad and dessert, all of which look absolutely stunning! I try to keep in the same general color scheme, but totally different colors are nice, too. I got this idea from a Ranch style family dinner at an older fishing lodge… (also a local Tea restaurant does the same with their tea cups and tiny plates) They had not one plate that was the same…it looked so adorable! The great thing about this way to go is if you break one, it is EASY to go to goodwill (where I got them in the first place!) and get more!!! Over the years I’ve collected a rather large set of glass buffet trays from the 50s They’re divided into sections including one for a matching punch cup. There is even a section meant to be an ash tray – yuck, but now everyone just puts food in that spot. I also always use cloth napkins at home, at the office, on the road; it can drive other’s crazy. When my second husband and I were married three years ago in his parents yard where we had met 6 years before, We used 33 of the glass trays, rented flatware, napkins, chairs and some of the tables. By renting the napkins we were able to match them to my husband’s kilt. I picked up some inexpensive, washable and reusable table cloths which can use at other events. We also used two of my punch bowls and served one spiked and one non-alcohol punch. When we were done, the rented items simply when in the company totes, and the washable items come home with us. I even put the glass trays in the dishwasher. Then they are stored in the attic until they are needed again. My mom has a collection of those plates! For labeling cups wax china markers will write on and wash off almost anything.